Last one from this set by Elemental that I intend to upload. I definitely like the heart one better, but in this one you can see the back of my hair so I figure it has its own special merit. Roxas is also cracking me up here. Anyone out there know the Lex's cosplay.com ID? 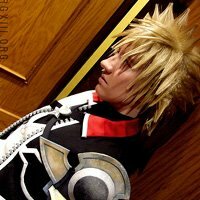 EvilSp0rk It's all soooo serious, and then there's Roxas. Amazing job! And a great shot :D Epic, in fact. clownrus This is such a cool photo. Everyones costume looks AMAZING!